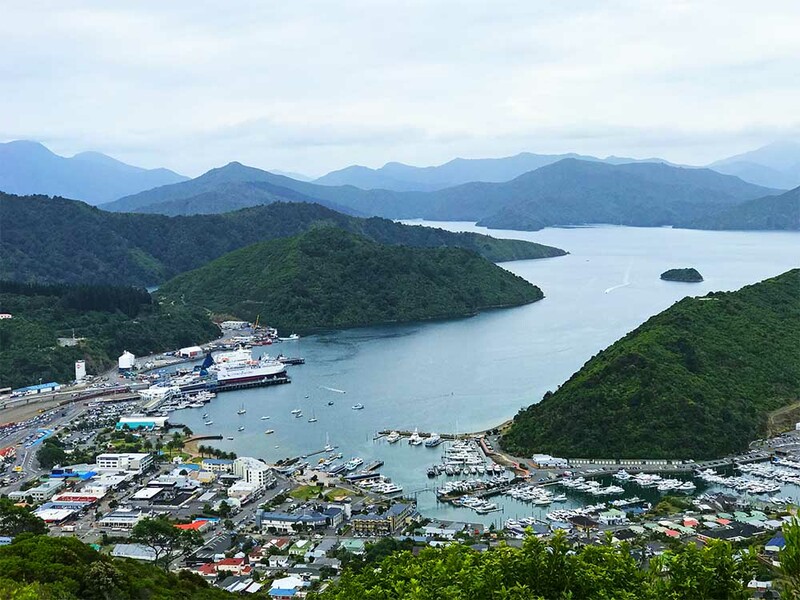 A view of Picton and the Marlborough Sounds. The second half of our New Zealand road trip took us to the South Island, and we kick started our journey in the sweet city of Nelson. To be perfectly honest, Nelson didn't sound that exciting when we researched it online so we only arranged to stay one night. Well, sometimes it's nice to be wrong. We absolutely fell in love with the place! The river walk. Yay for sunshine. Our love affair started the minute we walked off the plane and our luggage was delivered to us. The airport is so small that they don't even use a carousel. Then our taxi driver, one of the friendliest people on earth, turned off the meter and gave us a tour of the city before dropping us off at our hotel. Talk about things starting off on the right foot. And did I mention that it wasn't raining? Nelson welcoming us with a big warm hug of sunshine. Rosie admiring the ducks in Queen's Garden. With only one day to enjoy to our new favorite town, we wanted to make the most of it. Our day started with coffee at The River Kitchen, and a walk along the river until we reached the Queen's Gardens, a beautiful ornamental park. We explored the gardens, followed the lovely sculpture walk, and visited The Suter Art Gallery, where admission was free. Nelson has a population of less than 50,000 people, so we were amazed to discover such a world class gallery, but apparently it's due to the large number of artists that live in the city. Our favorite piece along the scultpure walk was this gorgeous sailing boat, perfectly positioned in the garden's lake. We wandered into town and drank local craft beer at Sprig & Fern, listened to a live 16-piece jazz band playing outside, and explored the vibrant Saturday Market which showcased all sorts of artisanal delights from the region. The city is packed with bars, restaurants, boutiques and galleries. Rather than feeling like a small city, it feels like a dense and dynamic neighborhood in a big city. For lunch we dined at the Boat Shed Cafe, overlooking Nelson Bay. We drank local wines, devoured the delicious local green lipped mussels, and high-fived each other for such a top day. If you're lucky enough to find yourself in Nelson for more than one day, there's also huge white sand beach to enjoy, as well as the magnificent Abel Tasman National Park nearby. We also really enjoyed this coconut cream and turmeric crepe filled with prawns, bean shoots, peanuts and cilantro, and topped with a lime and cilly dressing. We bid farewell to Nelson, and headed to Picton. New Zealand really is the perfect country for a road trip, with such dramatic and ever-changing landscapes to enjoy along the way. 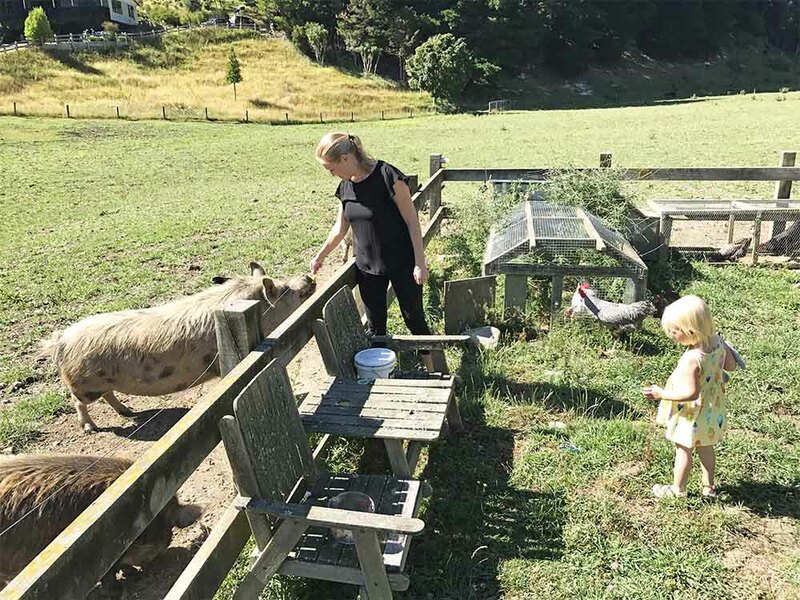 Rosie, like me, is an animal lover, so we decided to book a farmstay while we were in Picton. All the animals on the farm where kept by the owners for pleasure, and most of them came to the farm needing a home for one reason or another. One of these pigs was deaf, and the other blind. Needless to say their sense of smell, and delight for food, was well honed. The primary reason for our visit to Picton was to swim with wild dolphins. Kaikoura, further South, appeared to be the most popular spot in New Zealand for spotting wild dolphins, but I'd read lots of stories online about trips being cancelled due to rough seas. 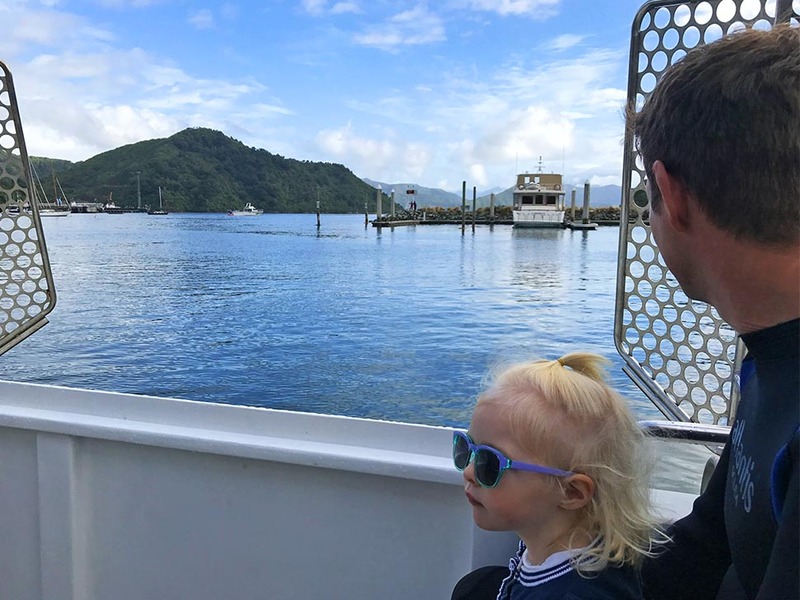 Then I discovered Picton, where wild dolphins swim into the Malborough sounds, an area of open sea that is as still as a lake, which sounded much more toddler-friendly. We chose E-Ko for our dolphin experience, comforted by their reputation as conservationists, wildlife experts, and environmental watch-dogs. They also don't use any means, like food, to attract the dolphins, so the whole activity is very ecologically considerate. E-Ko did not disappoint! Out on the Sounds we saw two pods of gorgeous Hector dolphins. This breed of dolphins is apparently normally quite shy and timid, but they're weren't on this occasion. Around a dozen of them jumped and played around our boat, entertaining us and showing off. Hector dolphins within feet of our boat. We had intended on swimming with the dolphins, if the conditions permitted, but Hector dolphins are endangered and E-Ko doesn't allow people to swim with this breed. Far from being disappointed, we felt really grateful that animal welfare was genuinely being prioritized over commercial endeavors. The whole experience was incredible. Out on the Malborough Sounds. 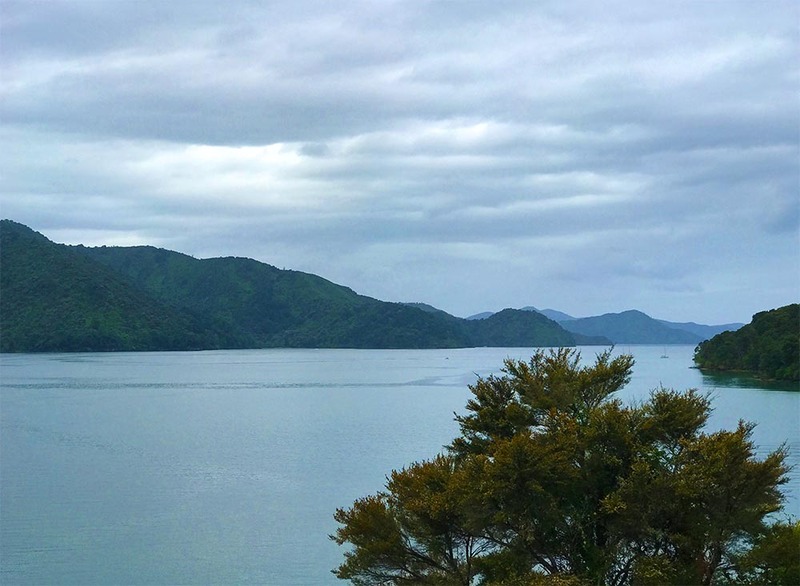 The Sound also provides locals with an abundance of seafood, included green lipped mussels, salmon, and Pāua - New Zealand abalone. Having only previously tried abalone in Chinese restaurants and not altogether loving it, I was pleasantly surprised by how moreish it was at Le Cafe. We actually ended up ordering Paua on a few more occasions after that meal; it was a treat to rediscover abalone in a new context. As if we hadn't had enough fun in Picton, we also hiked to the Pirongia summit along the Tirohanga Track. We slightly underestimated the walk we were embarking on with Rosie (in our flip flops), but the views of Mounts Taranaki and Ruapehu in the distance were worth it. Justin was a champion carrying Rosie on his shoulders for the 90-minute hike. Nothing like a bit of an unintentional workout on vacation. With all of that athleticism behind us, it was time to head to Renwick in the Marlborough wine region for some wine tasting!